The conversion wasn’t as simple as bolting on a coupe of blowers, though. As you might imagine, it took some extra engineering to coax out those extra 237 ponies. Each cylinder bank in the Novitec Edizione 747 has its own intercooler, which feature their own dedicated water-cooling system. The system’s radiator is placed behind specially created central air ducts in the front apron. Novitec also created a new underbody for the 430 Scuderia, which feature an integrated air deflector, routing the air through a larger custom intake manifold. The Novitec Edizione 747, along with its Bi-Compressor system, features a new ECU, which more effectively manages the upgrades and increases the redline another 200 RPM. A custom suspension includes a lower ride height and front-end lift system that raises the nose of the car 40 millimeters to avoid scraping curbs and speed bumps. 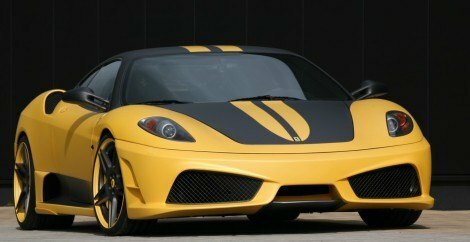 A special (but not particularly attractive) paint job colors the 430 Scuderia matte yellow and grey, which I think ends up looking a bit too “boy-racer.” Larger wheels created just for this car match the paint color, and Novitec adds black tail lights, side markers, and reflectors. Many of the engine components (see photo gallery below) are replaced with a matte carbon fiber piece. The interior, of course, was not left untouched. The new steering wheel is carbon fiber and leather with a flat bottom, the extended paddle shifters are carbon fiber, and if the buyer wants it, Novitec will give the car a two-tone interior trim to match the exterior theme. The incredible part of this car is its performance. The Novitec Rosso Edizione 747 can reach 62 mph from a stop in only 3.4 seconds, and its 0 to 186 mph time is only 22.9 seconds. It can reach a top speed of 218 mph, making it the fastest stock or modified 430 Scuderia in the world. No Comments on "Novitec Rosso Edizione 747 – A Supercharged Ferrari F430 Scuderia"